Alerted by the Ministry of Health, Médecins Sans Frontières established an emergency programme in Boda in August. MSF field coordinator Luis Tello said MSF’s original intention was to stay for three months, but the agency is now looking to maintain a presence in Boda at least until May 2010. Part of the problem is that the fields are being neglected in favour of hunting for diamonds. Farmers across Lobaye complain of falling manioc prices, a lack of basic tools, a shortage of credit and a lack of cooperative structures. Many farmers neglected their fields in favour of the chantiers, the mining areas. MSF’s tactics for combating child malnutrition include using a basic milk formula for new arrivals at the clinic in Boda, then moving affected children on to nutritional, therapeutic food, before giving them local food. Tello says there should be a monitoring period of six to eight weeks as the child gradually recovers. MSF offers an outreach service, driving, where possible, into outlying villages, providing medical care on the ground and ferrying malnourished children to Boda. Yangakola is strongly critical of dietary habits in Lobaye, arguing that the dependence on manioc has contributed significantly to the rise of kwashiorkor in the west. “They have got everything here, oranges, papayas, groundnuts, vegetables, maize, but it is always manioc, often cooked with just water, no oil and no salt,” a health worker complains. In the local market there is a brisk trade in manioc flour and coco, a green plant harvested in the nearby forest. “Coco and manioc make an easy meal,” says Christine Diango, a mother of seven. “It is not what mothers should be cooking, but meat, fish and vegetables are all very expensive here.” Much of the produce comes from Bangui, 145km east, with transport costs forcing up prices. While health activists like Yangakola talk about the need for a grassroots information campaign on diet and nutrition, the fight against malnutrition in Boda takes place against a background of infrastructural breakdown and sharp economic decline. Medical facilities in Lobaye are thinly spread, with an under-equipped hospital in the provincial capital Mbaiki the main focal point of a faltering health service. The road network is poor, with many regions inaccessible during the rainy season. Tello of MSF argues that a punitive cost-recovery programme, with patients charged much more than they can afford for treatment and basic medication, creates a dangerous dependence on traditional healers. As elsewhere in the CAR, diamond mining in Lobaye, which began in the 1930s, is exclusively artisanal, with all production coming from alluvial products of sand, gravel and clay. 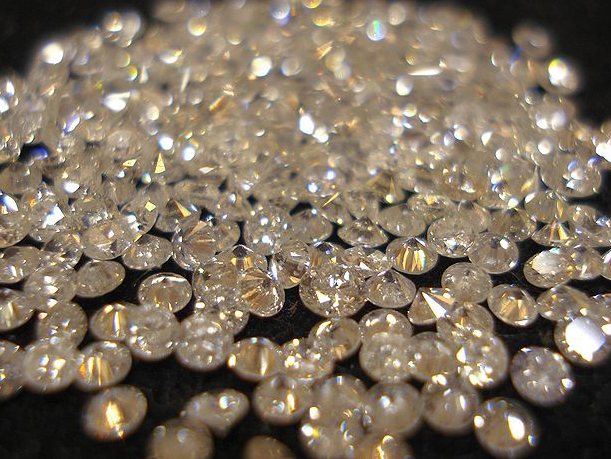 But diamond revenues have been badly hit by the international drop in prices, sparked in part by the global financial crisis. The industry involves a complicated network of regulated and informal actors, including the diggers, the site owners and the buying houses, or “bureaux d’achat”. The government closed most of these in 2008 as part of a heavily publicized campaign to clean up the sector, eliminating illegal practices and establishing better regulatory controls. One of CAR’s main diamond buyers, ADR, continues to operate in Boda, but other houses have closed. Much of the buying is done by local collectors, some of whom double up as site owners, or “chefs de chantier”, supervising the work of dozens of diggers, who are obliged to turn their stones over for sale to the owner rather than sell elsewhere. 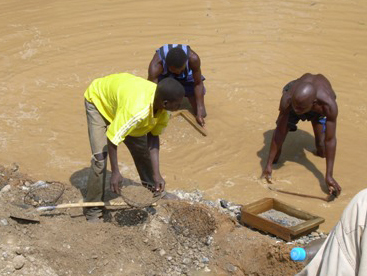 At Banagbélé, a diamond site 14km from Boda, off the main road to Mbaiki, the men dig and sieve. There is a scratch village here, with huts for workers. Most have come from Boda or nearby villages and many will see their families just once a week. Augustin Teng, 39, says he can earn between 50,000 and 100,000 francs (US$100 and $200) in a good month, but others are on daily rates of only 1,000 or 1,500 francs ($1 or $2).